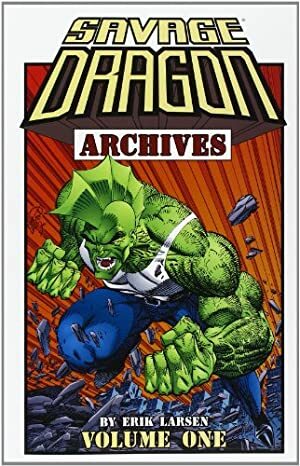 Arachnid is a monster/villain who appeared by the second issue of The Savage Dragon, back in 1992. He’s been occasionally returning ever since. Alter Ego: Ultimate Arachnid (may or may not be the same person). Base Of Operations: Chicago sewers. Height: 7’+ Weight: Several hundred pounds. Eyes: Red Hair: Brown apparently. Arachnid is a mutant with incredible strength. Arachnid is physically tough enough to withstand bursts from firearms with no ill effects, although he would fold against more powerful super humans. But his primary ability is to generate adhesive webbing from his wrists. It is capable of withstanding a stress of several tons. He was also faster than one would expect one of his size to be. During the early days of the Dragon’s police career, there were rumours of a cannibalistic freak living in the sewers of Chicago. The Dragon was sent in to investigate. Years of feeding on homeless people and children had left Arachnid very slow moving. Therefore, he was unable to put up much of a threat to Dragon. After a brief battle, the killer was arrested to answer for his multiple murders, although his real identity was never discovered. Arachnid then remained in Stronghold Prison ever since, although he nearly escaped when CyberFace caused a jailbreak while seizing control of the Vicious Circle. Archnid became a normal human in the wake of the Nega-Bomb explosion caused by DarkLord and the Covenant of the Sword. He was later killed along with every other person on Earth when Universo consumed the entire planet after it was chosen as his next meal. On the alternate Earth called the Savage World Arachnid’s history unfolded fairly similarly. There too he was incarcerated for his long years of feasting upon innocent men, women and children. But in this new reality, he managed to escape. After regaining his freedom, Arachnid attempted to abduct Angel Murphy to make her his next victim. Arachnid was opposed by both Dragon and Jennifer Murphy who apprehended him once more. Several years after this recapture, Arachnid was seen on the loose once again. He was in the stronghold of the Creator aka Johnny Redbeard. The details of his release remain unrevealed. He may have been set loose when CyberFace seized control of the Earth. Or fled when there was a massive breakout from Stronghold Penitentiary. This sighting of Arachnid was a bit different. He referred to himself as Ultimate Arachnid. It may, in fact, not have been the original, but one of the Creator’s creations. Or homages, as he called them. Dragon and his family later were granted a home used by the President of the United States as a reward. Arachnid was found to have been staying there. As it turned out, the President was being impersonated by the Imposter. Arachnid attempted to feast upon Angel Dragon once more. But the sight of Jennifer Dragon sent him fleeing, unaware that she had lost her powers since their previous encounter. Arachnid is a monster with enormous upper bulk, small legs and heavy arms. In addition to his normal arms, he has four extra long, spindly arms a bit below these. 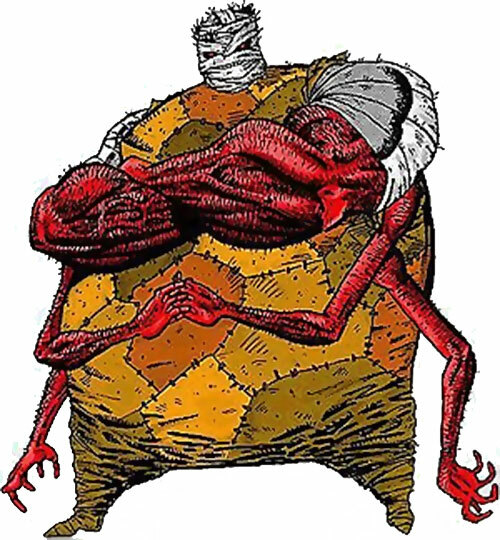 He wears a coat of patchwork clothing and has a bandaged, hairy head with red eyes and occasionally bandaged shoulders and legs. The monster has a large mouth full of broken teeth. While speaking and moving he makes some kind of monstrous sounds. Arachnid is a cannibalistic freak. He cares only for his own survival. He feels that he has to eat fresh, rare meat, and so he kills innocents and eats them. He had been hiding for years in the sewers, preying on the weak and on children. He became like a beastly animal in the process. It seems he eats more than he needed to and usually grows fat and lazy. Arachnid even kept bodies glued to the walls in the sewers so he could eat at any time. Although he usually keeps away from people and kills those he sees, villains have been known to convince him into going to a location or another with promises of good food. Arachnid gets real scared whenever he sees Jennifer Murphy, aka Smasher, who once gave him a severe beating. Being used to facing normal humans, he will attempt to escape if facing powerful super humans in general. Whatever humanity he once possessed seems to be long gone, and he has trouble remembering things. He seems to get dumber over the years. Arachnid follows his instincts and can be fooled or intimidated, particularly when he knows he can be hurt. He retains his ability to speak even if he always refers to himself as Arachnid. Arachnid sounds like a bad Spider-Man clone. In the DC Universe he could be an experimental hybrid clone of a human and an insect created by LexCorp or Cadmus Project. His mind is becoming more animalistic over the years, which could be a degradation process. The story of Arachnid is bloody and he would likely have tangled with some of the Charlton heroes. Snare and Glue powers have no AV (-1) and Arachnid aims using his DEX score. MIA (Eating people), MIF (Jennifer Murphy aka Smasher), Secret Identity, Strange Appearance. Helper(s): www.thebrotherhoodofthefin.net (defunct), Sébastien Andrivet.